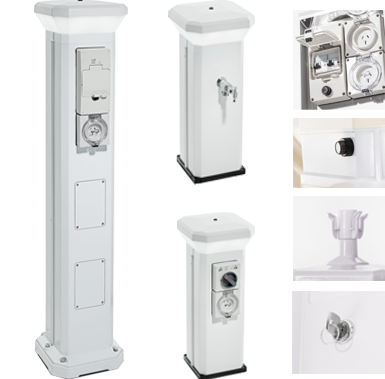 The M series service pillar is a versatile and compact slimline design and provides essential marine services. The popular M500 Pontoon Mate is a tried and tested service pillar for private jetties that has stood the test of time against many storms across Australia. The compact modular design provides simple and effective power, water and light. The PVC non corrosive body is impact and UV resistant. A robust lockable 15amp 56IP rated switched power outlet is included with RCD protection coming from the home or office circuit. Power can be controlled at the main switchboard or at the jetty. The pedestal is bolted to a base plate 180mm x 180mm square which is fixed to the jetty. With the modular design parts are readily available should they ever be required. The M1000 is best suited for up to four 15amp outlets, four taps, LED light with PE Cell. Suitable also for private jetties where more height is required. Add a Photo Light Sensor PE cell to control light turning on and off automatically. Add 1 approved Din- Rail kWh Meter for user pay power. Add 1 water meter for tap. * Add 15amp Power Outlets up to 4. * Add 32amp or 63amp 3 Phase Outlets. * 4 of each TV, Phone, Data outlets. * Can be made with switched outlets. * Add up to 4 approved Din- Rail kWh Meters for user pay power. * Add up to 4 water meters for tap. * Remote metering controller to link with Comsen Control Remote Utility Management System. Easy access for electricians to all power outlets and electronics through 4 service panels. reliability with a 5 year warranty. 15amp GPO’s IP66 three pin- flat- spring loaded power outlet. 3 Phase outlets if required – spring loaded.